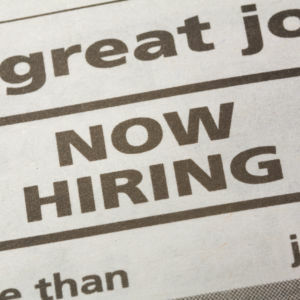 The workforce saw a slight increase in employment growth with an additional 98,000 new jobs for the month of March, according to a federal report Friday. President Donald Trump has overseen steady employment growth since entering office. The positive trend started in the final years of the last administration. The Bureau of Labor Statistics found in its latest jobs report that the trend continued with a slight uptick of 98,000 new jobs. The previous jobs reports over the last year usually saw greater job growth closer to 200,000. The unemployment rates has hovered around 4.5 percent for several months, meaning there are less people in the labor market to fill new positions. There are still plenty of people outside the labor force. Average wages increased by five cents and now sit at $26.14 for the month of March. Wages in recent months have shown slow but positive growth. Professional and business services saw the most significant increase of new jobs at 56,000, followed by mining and healthcare. Retail trade lost jobs. The labor market still faces some significant issues despite the positive trends. The labor force participation rate and underemployment have been problematic since the recession. Underemployment occurs when workers are stuck in part-time positions or can’t find roles that match their training or economic needs. The labor force participation rate tracks the number of employed and those actively seeking work as a percentage of the total population. The participation rate has dropped considerably since the last recession and now sits at 63 percent. It has leveled over the last year, but has failed to regain those losses. Sweet adds that the mix of job growth begins to favor high wage industries as economic expansions age. The current recovery just happened to be very long, so that change hasn’t started happening until just recently. He notes a tighter labor market will cause wages to increase which will further incentive people to enter the workforce. American Staffing Association (ASA) predicts similar trends based on what’s happening in staffing employment. The industry has started to see a slowdown when it comes to employment growth. Some sectors like staffing employment can serve as indicators for where the rest of the labor market is going. The Gross Domestic Product (GDP) last year showed a positive increase after being stuck around one percent. GDP tracks the total dollar value of all goods and services produced over a specific time period. The stock market has shown positive growth as well. Gallup has reported economic confidence has remained around a record high. Trump has promised to protect domestic workers from unfair foreign competition. He has primarily focused on trade and immigration. Nevertheless, there is concern that too much economic protectionism could cause problems, even for the domestic workers it’s meant to help. Republicans are hoping to spur economic growth through regulatory and tax reform. They released a blueprint designed to simplify the tax code while also lowering taxes for upper and middle-income earners. Even some supporters of the plan, however, are concerned with provisions like the border adjustment tax. The jobs report does not include farm workers, private household employees or nonprofits.